This is just too funny.. The Economics Ministry's administrative office for safety and health in business has sent an administrative order to a number of matza-baking factories, in light of deficiencies and health breaches discovered in these factories. The administrative order gives them 3 weeks to repair the breaches and fix what needs to be fixed - or else they will be shut down. Needless to say, in 3 weeks the matza factories will already be closed as the Pesach season will be long gone. In a new story that is as old as the Talmud, an Egyptian journalist wants to sue Israel for the Ten Plagues. Ahmed Al-Gamal, an Egyptian journalist, has called upon the Egyptian government to sue the State of Israel for the Ten Plagues. Al-Gamal says that our ancestors were hit with the Ten Plagues as a result of the curses of the ancestors of the Jews. Our ancestors did not need to suffer for the mistakes of the ruler of Egypt at the time, whom the Torah calls Pharoah. The Torah proves it was Pharoah who afflicted the Jews, and not the Egyptians. Yet they then brought upon us the plague of locusts that destroyed Egyptian agriculture, blood that turned the Nile to blood and nobody could drink for a long time, darkness that turned days to nights, frogs and a plague that killed firstborn sons..
Al-Gamal also says that for 40 years as the Jews traveled through the desert, they benefited from Egyptian products they had stolen on their way out. He specifically mentioned the gold, silver, copper, valuable gems, materials, leathers, wooden beams, wool, animals in order to build their Temple in the desert and to serve their religion. Desert nomads could not have owned such possessions and they must have been stolen from Egypt (I guess he does not know the midrash about the Jews being given the wealth on their way out after having found it all during the plague of darkness). Al-Gamal also wants Egypt to sue the French for Napolean's invasion of Egypt, the British for their colonialism, and Turkey for when they conquered Egypt during the time of the Ottoman rule. 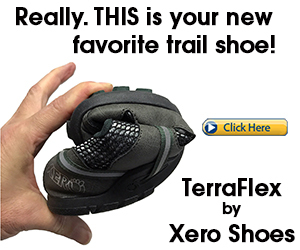 This is not the first time such an idea is being suggested. It was suggested in 2003 by a Dean of Law in an Egyptian university suggested the same. Before that the Gemara in Sanhedrin relates a story of such a lawsuit being prepared, which Alexander the Great quashed after hearing the counter-argument that the Egyptians owe much more money to the Jews for enslaving them for centuries. I don't need to make the counter-argument that has been made in the past. The years of unpaid labor, adding unpaid overtime and pensions, the assault, beatings, murders, inhumane treatment, etc. As well, it was not the Jews who smote the Egyptians with plagues, but God. Why sue the Jews - just because of undetailed "curses"? And why sue Israel rather than some other global consortium of Jews - Israel only represents about half the worlds Jews - why not sue all the Jews? I find it interesting that he both uses the Torah as his source, as the Quran itself supposedly tells a different story of what happened in Egypt. 1. if they believe the historical accuracy of the Torah, as shown by this lawsuit idea, the rest of the Torah should be accepted by them as well - the promises of the Land of Israel to the Jewish people and anything else relevant. If they don't believe the historical accuracy of the Torah, then this lawsuit idea is just a nuisance. 2. if they can [repeatedly] come up with such an idea for a lawsuit based on the Torah's description of events, it cannot really be for a real lawsuit. i cannot believe the Hague or some other court would actually try a case based on such claims, but perhaps it is to give us a "kick in the pants" as some sort of reminder or booster to our own faith and approach to the stories of the Torah. It is both a sad and a happy day when a prime minister (or president or mayor or city councilpeople or other important dignitary) gets convicted for his crimes. Sad: it is a shame we have corruption at such high levels. I think it reflects poorly on society. 1. a group of rabbis, supposedly from the full spectrum of religious Judaism, have officially submitted a request to Prime Minister Benjamin Netanyahu to allow them to build a shul on Har Habayit. In the letter they wrote that Har Habayit is a special place for prayer, and as prime minister they request that he do what is necessary to establish a respectable place for prayer for Jews on Har Habayit. The letter was signed even by rabbis who do not approve of Jews going up on Har Habayit, because the location identified for construction of such a shul is a spot on Har Habayit that everybody agrees was not the location of the mikdash. 2. There will be a demonstration of the sacrificing of the korban pesach on April 10. The demonstration will include shchita of sheep and sprinkling of blood on a mock-mizbeiach/altar, wearing of priestly garments, and roasting of the sheep the way it was roasted as a korban. The demo will take place in the Kiryat Moshe neighborhood of Jerusalem. The event is described, by the Har Habayit activists arranging it, as intended to arouse a sense of missing the mikdash. 3. as in previous years, you can join a group for korban pesach, on the chance that we will b e given the opportunity before Pesach to offer the korban. The cost is just 12nis per subscription. In light of the increased enlistment of haredi soldiers, with the increase expected to continue in light of the new draft law, and the increased involvement of the haredi soldiers in combat situations, such as in Netzach Yehuda, the IDF is committed to solving the dilemmas faced by the religious soldier. To that end, the IDF recently published a pamphlet, put together by army rabbis, that deals with those dilemmas and various situations a soldier might find himself in and not know what to do. The information is compiled based on many years of experience in dealing with similar scenarios. The pamphlet has been dubbed "The Ten Commandments for the Haredi Soldier", but it is really called "Halachic Instructions for Combat Actions". The pamphlet mainly deals with issues related to Shabbos observance. The very first directive emphasizes that the mentioned rules apply only when there is no urgent need for action. In other cases – like a firefight or immediate danger – the soldier must fulfill his mission as soon as possible. "Desecrating Shabbat due to operational necessities is not a sin, but a mitzvah," says the pamphlet. Shabbat check-list: Remove unnecessary equipment from flak jacket and vehicle, change batteries in radio equipment, prepare list of guard shifts, call parents to wish them Shabbat shalom, light candles. Refuel vehicles and check water and oil before Shabbat. Civilian action or operational activity? Determine beforehand whether the weekend missions are of a civilian nature – like securing tourists and reinforcing other units. Driving on Shabbat: One should not push the gas pedal unnecessarily nor drive more than is required. Driving is only permitted for security incidents and medical emergency. Using electricity: A fan may be turned on only if the temperature may harm the operational status of the unit. Using radio: Announce ahead of time that you do not answer non-operational calls on Shabbat. If there is any doubt as to the nature of the call, the soldier must answer. Outpost and base drills: Only before Shabbat. Sticklight and thermal bag: Permitted on condition they prevent worse violations of Shabbat. Flak jacket may contain food, snacks, Torah, map, binoculors, compass, and night-vision gear, but not sunglasses, keys, and wallets. Driving to a guard post on the far-side of the base is not permitted, and the soldier should consult with the rabbi on the correct procedure for larger bases. Showering on Shabbat: The IDF heats its water using a thermal system relying on gas and solar energy; thus, hot water is not allowed on Sabbath. Cold showers are permitted. While some might compare this to the pig described in the Torah who hides his snout (to hide the lack of the chewing of the cud) while sticking its split hooves out to make itself look kosher, I see this as an attempt to deal with the new reality. The religious soldiers, haredi as well, will be increasing in coming years. If the IDF wants the transition to go relatively smoothly, these are issues it must deal with, and they are. The Chief Rabbi of Iran, Rabbi Yosef Hamadani, has died. Rabbi Hamdani has served as Iran's Chief Rabbi since 1994. Yisrael Hayom [newspaper] is 'Pravda', it is a newspaper that is the trumpet of one person, that being the Prime Minister... I hoped the Yisrael Hayom would be a national newspaper that would contrast all the other papers and media, but it has not turned out like that. At every juncture where there was a conflict between the national interests and the prime ministers interests - the newspaper always preferred the prime minister. In the declaration of a Palestinan state, the paper supported the prime minister, in his Bar Ilan speech, the paper backed him, in his fights with Feiglin, in his fights with me.. It upsets me and disturbs me a bit..
Is cheating allowed in school? copying work? Surprisingly enough, it depends who you ask. While many poskim will say it is prohibited to cheat in school, I can even see some giving perhaps a private, not public, psak saying ti is allowed. I cannot even think of any rationale that works, but I can fathom it happening. I cannot fathom a rav giving a public, general, psak that cheating is allowed. Rav Avraham Yosef, Chief Rabbi of Holon, paskened so on the Moreshet "Ask The Rabbi" site. My friend needs to submit work in university. She took work prepared by somebody else and asked me to help her rewrite it so it would not look noticeably the same (the original was submitted to the same professor). I think the professor is aware of the industry of recycling schoolwork in his course (the fact is that he gives the exact same material), but I am not sure. Am I allowed to help my friend rewrite the work? It is allowed, and it is a mitzva of gemilut chessed (kindness), especially if she knows the material. Understandably this psak raised a firestorm. I still cannot believe any rav would give such a psak in public. A students organization wrote complaining about the psak saying it is prohibited by university rules, as well as immoral. In all the various articles I saw regarding this subject, including on the frum websites, in none of them does Rav Yosef respond and explain his psak or his rationale. It makes no sense to me. His answer does not even make sense to me. gemilut chessed to cheat? In my attempt to be dan lkaf zchus, give him the benefit of the doubt, this is the explanation I was able to come up with. Possibly, Rav Yosef misunderstood the original question. Perhaps he understood the question to be not about cheating and copying schoolwork, but to be about helping another student write the work rather than making her write it herself. Perhaps Rav Yosef understood the question to be if she can help her friend write her paper or not. And to that Rav Yosef responded that it is ok to, it is gemilut chessed, as long as the student knows the material, so the helper isnt the one really writing the paper. The great gefilte fish ban of 5774 worked. According to Bechadrei, Rav Landau, rav of Bnei Braq, worked very hard to get the prices of gefilte fish down. Actually, he worked hard to get the price of Carp down, and the result will be cheaper gefilte fish (among others). The price had risen from the normal range of 25-27nis per kilo for Carp to the price range of 35-37nis per kilo! That would make your gefilte fish very expensive... and besides for gefilte, people eat plenty of regular fish as well on Pesach. Manufacturers blamed the increase in price on a supposed shortage of Carp, saying the final price could even hit 40nis per kilo by Pesach time.. According to Bechadrei, Rav Landau worked very hard and achieved success so that in Bnei Braq the price will be relatively cheap - at most 31nis per kg. I think the serious complaint is that of religious and traditional Jews who feel blocked out due to the holiday. The Stones concert is scheduled for June 4, Motzei Shavuot. Sunset on June 4 will be about 7:41pm. "Stars out" will be about 8:01pm at earliest. With the Stones planning to take the stage at 8:30pm, religious fans will have to decide to either not take out a mortgage to buy tickets and miss it, come late because they will only leave their houses after the holiday is out, or stay at a hotel in the Tel Aviv area. It's unthinkable that such a show will cause a mass desecration of the holiday by hundreds of thousands of people," he explained. "It's illogical to force the Israel Police to work from 2 pm, operate an entire system and violate the holiday marking the giving of the Torah to the Jewish people. There is no way of participating in this mass event without actually desecrating the holiday." This isn't the first time Slomiansky launches a battle against Shuki Weiss. "Last time he tried to bring Depeche Mode on Tisha B'Av, and eventually they didn't come," the MK said. "No one would let this happen on Memorial Day. There is something wrong here. Is money the only important thing? What about our values?" Slomiansky says he has nothing against the band, and even put on a Rolling Stones T-shirt to prove his point. "On the contrary, it's an excellent and highly esteemed group, and I appreciate the fact that they are coming to Israel at such a time, when many others are avoiding and boycotting us. But why shouldn't religious people like me be able to enjoy the concert too?" he asks. It is nice the Rolling Stones are coming. At a time when the BDS movement is so active, it is good to see performers, especially such big name performers, coming and supporting Israel. Let's have some fun with this. On Twitter Lahav Harkov had a contest going for #RollingStonesShavuotPuns. Mine would be that they should change their name to "Throwing Stones" and perform in Mea Shearim or RBS B..
Is Modiin really worse than a gas chamber? we regularly hear how great of a city Modiin is.. the residents of our neighboring city especially like to point out to us residents of Bet Shemesh how great Modiin is every time Bet Shemesh makes the news for some crazy incident.. It was pretty shocking to read today in the news that some young adults hate Modiin so much that they compared it to living in a concentration camp! A 21 year old male posted to his Facebook page how bad it is in Modiin and said that it would be better to be in the gas chambers than to be in "this city". He generated a lot of discussion, with many people coming out and supporting his statement. He explained what he said by saying that this feeling they have is due to the lack of entertainment options available in the city. Funnily enough, residents of many other towns, including Bet Shemesh, keep their eyes to Modiin for their entertainment needs! In Modiin they have a skate park, bowling alley (which we now have in BS as well), movie theater among other things. While far be it from me to say whether there is enough entertainment available for the young generation in Modiin, it seems to me to be quite crass to say it is so bad that a gas chamber would be better. Comparing life to life in a gas chamber just because there is a shortage of bars and discos is truly insulting. can youth be satisfied? no matter what or how much the city provides, eventually they will get bored with the available options, and will want more or different things. Is the answer to simply add more buses at night, so they can go to Tel Aviv and party all night long? A bedroom community like Modiin is never going to be able to provide enough entertainment to keep every kid happy all the time. "Malchut Wexberger" posted these two images from their new hagadot on their Facebook page .. The second is from the haggada printed for the "Gruzini" community..
We are at a point at which in order to extend the negotiations the Palestinians request more and more concessions - there is no more place for one-sided concessions.. in the past we have paid difficult prices, and today there is no more place for more concessions and another freeze just so the Palestinians will deign to continue negotiating with us..
this is very long.. and I only watched one part of it... I was interested in the part in which Rav Gedalya Dov Schwartz was awarded the Rav Yosef Dov Halevi Soloveitchik ztl Aluf Torah Award... and that begins at about the 1:32:00 mark and continues until about 1:52:10..
Israel Police Commissioner Insp.-Gen. Yohanan Danino, during the course of a study day for the senior Israeli Police command at the Menachem Begin Heritage Center in#Jerusalem to mark the 100th anniversary of the birth of former Prime Minister Menachem Begin, gave the sword of Zeev Jabotinsky to Prime Minister Benjamin#Netanyahu. The Israel Police Education Officer said that in 1920 Zeev #Jabotinsky had been arrested by British police officers in the wake of his involvement in a Jewish defense organization in Jerusalem following the riots which occurred that year. His sword was taken from him during his arrest. The sword eventually passed to a British police officer. Several years later, the officer's daughter gave the sword to British historian Martin Higgins, who specialized in the mandatory police and whose father had been a police officer himself. Higgins gave the sword to the Israel Police. The sword had previously belonged to a senior Ottoman officer and apparently came into Jabotinsky's possession during his service as an officer in the framework of the 38th Royal Fusiliers during World War I. It sometimes bothers me how the Litvishe have become so Hassidishe in recent years, and the trend seems to be continuing.. it manifests itself in many ways, and in some ways they have even become more hassidishe than the hassidishe..
For some reason rain and mikva seems to be a common theme for the new hassishe rebbes.. Last year we had Rav Chaim Kanievsky promising rain for a new mikva.. this year we have Rav Shteinman promising rain for a mikva.. According to Bechadrei, prior to the last set of rains right before Purim, an organization dealing with the building of new mikvaot went to Rav Shteinman. They expressed their concern about the dry winter, in light of the amount of rain water needed for the opening of some new mikvaot that were under construction. Rav Shteinman, reportedly, smiled and said there will still be more rain coming. Sure enough, just a few days later, and another storm with a weeks worth of rain hit Israel. On Purim, after the storms concluded, Rav Shteinman expressed satisfaction that the cisterns for the mikvaot had been filled. The USA made an offer to the Palestinians that Israel would release more terrorists in exchange for the Palestinians continuing to participate in the peace talks. Unfortunately for the Americans, they failed to clear this deal with the Israelis before making the offer to the Palestinians. In exchange for Israel's agreement, they had to offer to release Pollard. The message of the video is about protecting yourself by wearing your tzitzits. Jerusalem police arrested a rabbi and his student on Friday for trying to slaughter and sacrifice a female donkey. The 54-year-old rabbi and his student aged 24, were arrested near the of the Tomb of Samuel the prophet which is located in the West Bank north of Jerusalem. The two suspects purchased the female donkey, or jenny, from a local Palestinian and were later caught on camera by another local trying to slaughter the animal, police said. The man filming the incident alerted the police. The suspects, residents of Jerusalem, confessed that they were slaughtering the jenny as a sacrifice for their sins. The Jerusalem Magistrates court was deciding Friday whether to remand the suspects into custody. The donkey was brought to a Ministry of Agriculture facility in the Jordan Valley. The Ministry of Education has announced that it is going to get involved in supervision and enforcement of tuition limits even in the unofficial school systems. I don't know what the official amount for 100% tuition is, but it seems that until now many schools would receive the tuition subsidy from the government, and then still charge the parents whatever they felt like charging - even if adding the parents portion to the government subsidy it came to higher than the 100% tuition they were allowed to receive. Now the Ministry is going to enforce that schools cannot take more than 100% tuition. Schools in the private educational systems receive varying amounts of subsidies - anywhere from 55% to 75%. Most "cheiders" in the haredi community receive in the range of 55% subsidy based on their status of "recognized but not official", and that means they would not be allowed to charge parents any amount beyond the remaining 45% of the maximum tuition number. Those cheiders associated with organizations like Maayan or Chinuch Atzmai, often receive as much as 75% subsidy, allowing them to charge parents the remaining 25%. This is supposed to help the parents by limiting their maximum tuition payments. It seems like we are practically on our way to getting our own autobahn here in Israel. The autobahn is a street in Europe famous for not having a speed limit. Minister of Transportation Yisrael Katz yesterday signed an order that will allow the speed limit on "fast highways" to be raised to 120kmph. He intends to approve the limit on Highway 6 to be raised to 120kmph after it finishes some prep work on the road in the coming weeks. I was on Highway 6 last night. When it is empty - 120 feels slow. What a great road! The Ministry of Education has been moving on a plan to shorten the summer vacation. This past year the MoE began the school year prior to September 1st as part of that program, and according to plans the opening day was supposed to get even earlier in coming years.. The Ministry of Education today announced it has scrapped the original plan and will move "opening day" of the school year back to September 1. They are going to make other changes though. That pointless vacation they give after Yom Kippur until Sukkot? done? no more vacation. All that vacation during Channukah? This will be shortened by 2 days. Ridiculously long Pesach vacation? Now it will be 2 days shorter. This is in addition to the summer program the Ministry of Education will begin operating this summer that will run for 3 weeks as a natural continuation of the school year. People that have troubles come.. also people with personal troubles and also when the general troubles affect them. You should know these troubles are the birth-pangs of mashiach. We are already seeing the light, and every person must strengthen himself in some thing, even something small. In Heaven every thing is important, even things that to us look small - in Heaven they are all considered big things.... everybody knows what he himself needs to fix and in what he needs to strengthen himself, so everyone should do an accounting and accept upon himself to strengthen himself and in this merit, we will soon arrive at the true and complete redemption. Are you the proud own of an iPhone or other form of smartphone? You can now add to the list - you cannot work for the Irnstein Matza Factory. According to Bechadrei, Irnstein Matza has advertised that all of the people, with no exception, working for them making matza are God-fearing people and have declared that they do not have unauthorized smartphones in their possessions. Whew. Matza that will be made by only kosher cellphones. 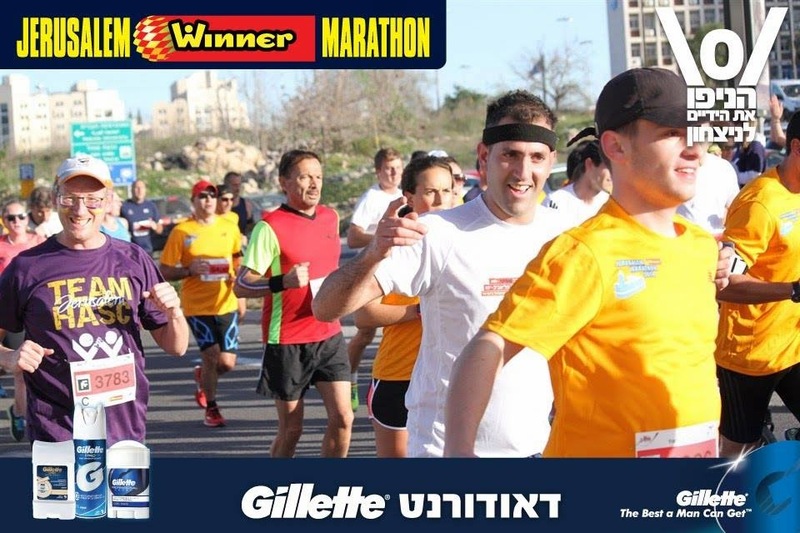 The Jerusalem Marathon is an absolutely fantastic event. Every single year. 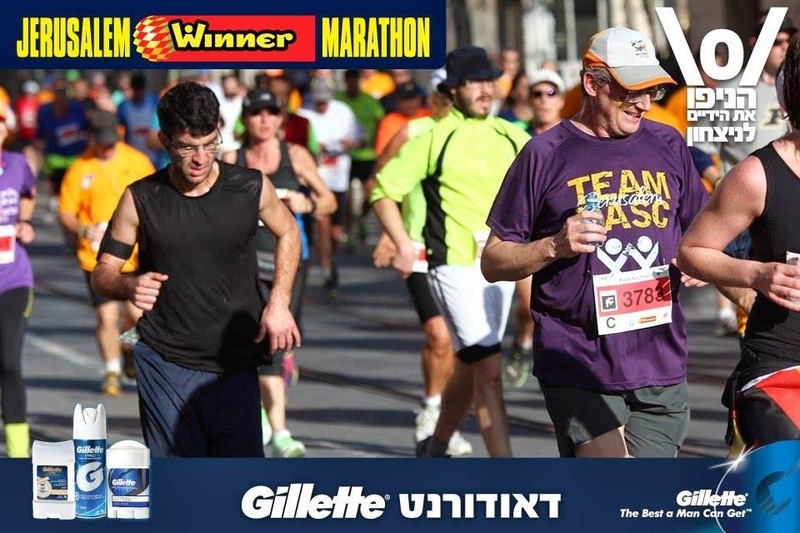 Sometimes the weather is better, and sometimes it is worse, but the Marathon event is always great - it is fun, it is inspiring, it is exciting and it is all in Jerusalem. But I was not going to participate in it this year. 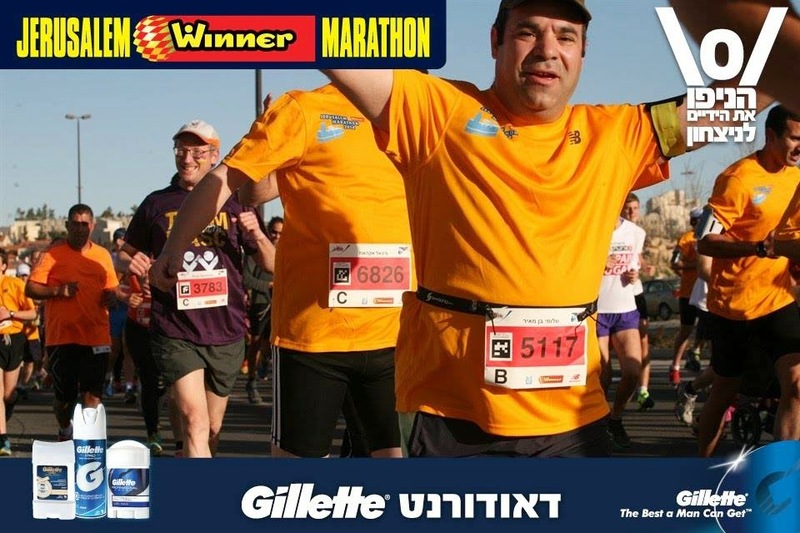 I had decided to take the year off from running the standard Israel marathons, and that included Tiberias, Tel Aviv and Jerusalem. Even though I could have planned to run the half instead of the whole, I still felt like staying away from the major events. And then HASC came calling. 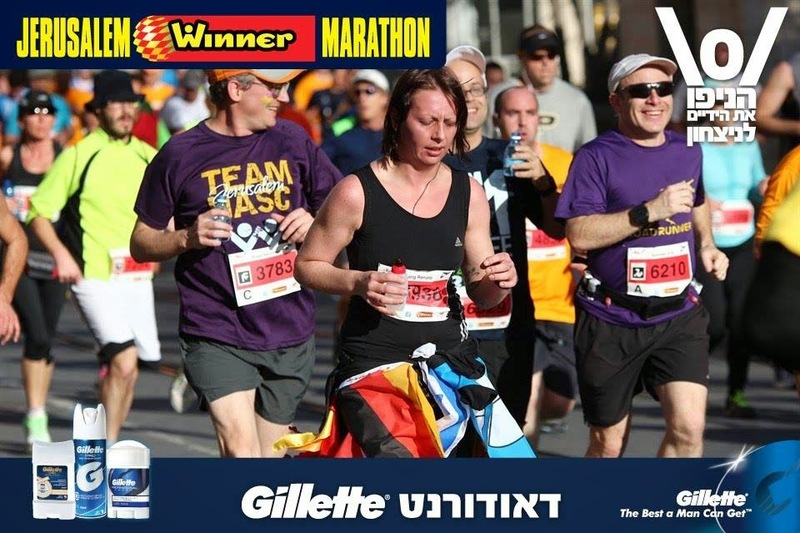 A couple of weeks ago HASC asked me if I would run for them in Jerusalem, and I could choose to run either the half marathon or the 10km race. When an organization like HASC comes calling, you can't just ignore them. 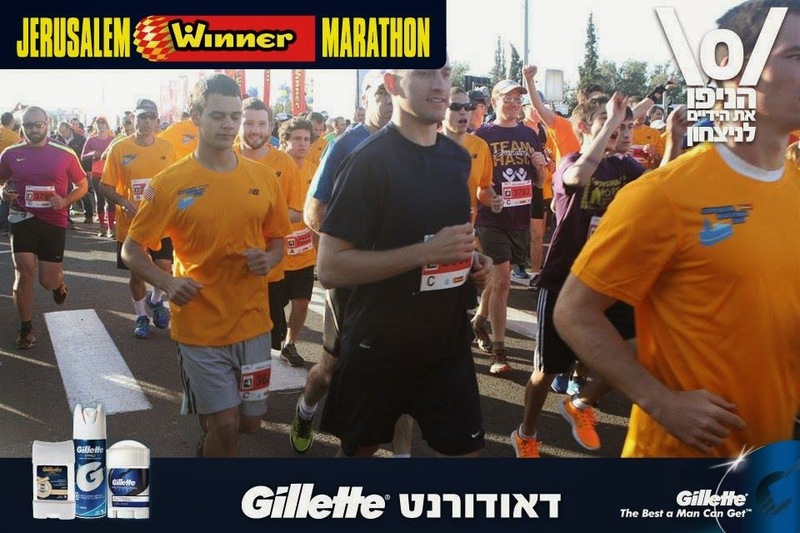 I had an opportunity to help a great organization, without even needing to do fundraising, and enjoy the side benefit of participating in the most enjoyable running event in Israel. So I said yes. 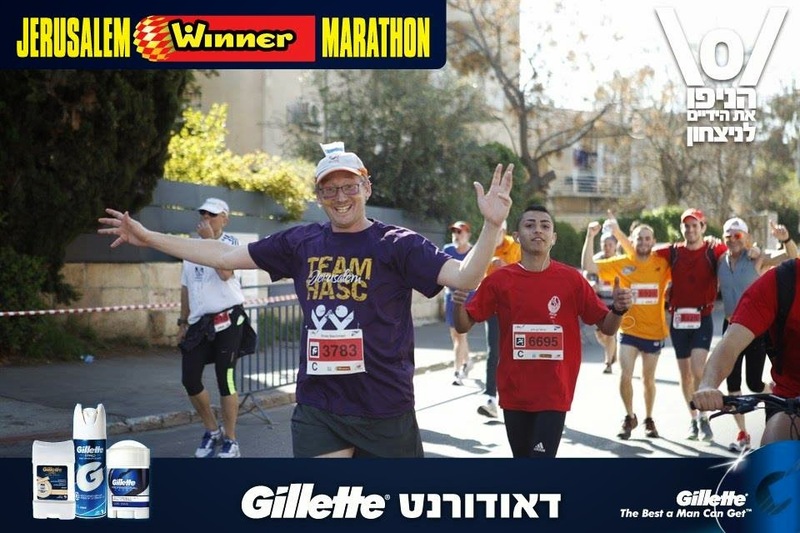 I would run the half marathon for HASC. I did not train for the run. I was recovering from a bout of the flu. I only received final confirmation of my participation the day before, on Thursday. I did not know anything about the weather forecast or the details of the route. I decided I would not even take my watch along. I was just going to run - slowly - and enjoy. After the first couple of kilometers I bumped into a couple friends - the Sommers brothers, and we ran the next 5 or 6 kilometers together and had some great conversation. this is a finish line photo taken by my friend Randy Zelcer. He had not even noticed me, and my face is blocked by the water bottle held by the guy in front me of. He was actually taking a picture of the motorcycle crossing the finish line. The guy whose image is blocked by the motorcycle is Mayor of Jerusalem Nir Barkat. His finishing time was 2:22:47. Mine was 2:22:46. That's right - I finished the half marathon two steps ahead of Nir Barkat. Truth is, I had run the last 5 or 6 kilometers with Barkat and his team right behind me. At some point I thought of slowing down slightly and approaching him to say how great of an event he puts on and slap him five. Then I thought that if I approached him during the run like that, one of his bodyguards and running partners would give me some sort of krav maga kick in the head and that would be the end of my run.. so I waited until after we crossed the finish line. After the finish line I did turn around and go over to him, after he and his team finished high-fiving and hugging each other, and I congratulated him and complimented him on the event. Also, if you look at the picture, you'll see that I did not have my hands raised in the normal finish line style of raising your hands with V signs for victory. You can see that I was making some strange symbol with my fingers. That symbol I was making was the hashtag symbol - the pound sign, #. I was making the hashtag symbol to represent the "happylanche" hashtag created by my friend Ahava Emuna Lange, formerly known as Erika. Ahava Emuna is very not well with cancer and has just started a round of chemo. 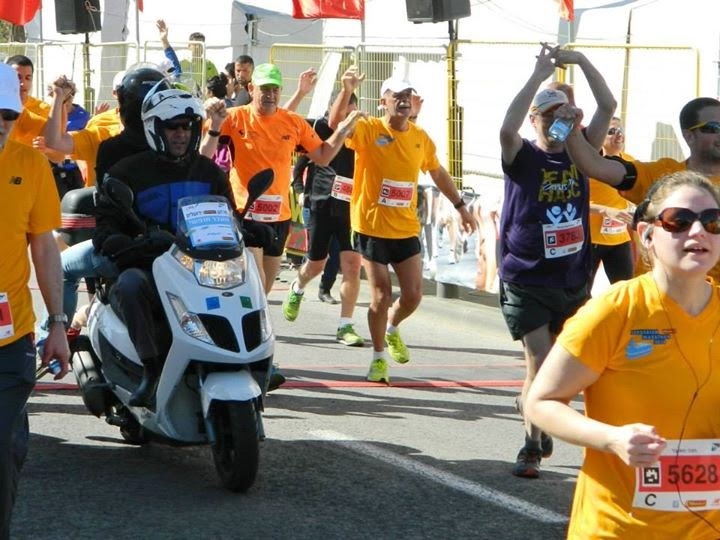 With Ahava going through so much and still trying to find every possible way to be happy and surround herself with happiness, I dedicated my happy event of the Jerusalem Marathon to Ahava's happylanche. An avalanche of happiness. After the finish line, I made my way down to get my bottle of water and medal, an awesome clementina, and then to find the HASC booth again. I picked up my stuff from the booth and saw the other few runners who had run the half and the tens of runners who were getting to run the 10k race for HASC. HASC put out for them drinks and food, along with paraphanelia such as the HASC shirts and kippot and other things. And most of all there was great camaraderie and friendship and excitement among the runners and the staff at the HASC booth. They really are a great organization, they had a lot of great and dedicated people (including a few people I know) running to benefit HASC, and HASC was doing everything they could to support and help the runners. I was proud to be associated with HASC, even if for just one Friday morning in Jerusalem. Illegal Journey is a historical novel, which in my book is an immediate plus. You get to read an enjoyable story while learning about a point in history at the same time. And when the book is written well, when the history is portrayed and the story is riveting, then it is just a great book. As is Illegal Journey. Illegal Journey is set in Europe, Palestine and eventually Israel. It describes, through its story, the history of illegal immigration from post-war Europe into Palestine. While I am not aware of this story actually having happened - as far as I can tell it is fiction - but it does show what the Jewish survivors of the concentration camps had to go through to get to Palestine, and how they were often turned away by the British. In Illegal Journey, a gentile in Switzerland becomes aware of a group of Jews in a hospital recovering from what they suffered in the concentration camps. He was so shocked by what he saw that he "adopted" this group and found ways to help them. Eventually this led to his devising a plan to help them sneak into Palestine. Peters drops everything and commits himself completely to this project and becomes very close with the entire group. He even decides to join them in going to Palestine, and so he does. I don't want to give away much of the story, because while it is a historical novel, it is also fiction and I don't want to ruin the story part of it for you. The only part of the book I was disappointed in was the ending. I thought the book finished off kind of weak, for what was such a good story. The book is a good read - the story, as I said, is riveting. You get caught up in the characters and the relationships. Because the story is so good, it is also a fairly quick read. Once I started reading it, I hardly put it down and finished it pretty quickly. Besides for the novel part of it, the historical part of it was fascinating. I never previously really read much about the illegal immigration period. Sure, I've read the basics and I know the main historical points, but Illegal Journey gives a much deeper look at the entire period in history, how people snuck in, how the British tried to prevent it, employing spies through European ports, disabling boats with explosives, politics, maritime lands and searches, etc. I really enjoyed the historical aspect of the novel and found myself learning a lot about pre-State Palestine. Another yeshiva boy was recently arrested for ignoring his initial draft notice, leading to protests around the country. For some background - There has been a process in place for the yeshiva boys. It might change, it surely will change, with the new draft law in place, but for now the process has been in place. Yeshiva boys appear before the draft board upon receiving the first notice. They go through the process of interviews, tests, medical exams, etc. At the end of the process, they do not sign the final paper, thus not agreeing to be drafted... and then they are in the system like all the yeshiva boys. Most yeshiva boys do not get arrested, because they follow the agreed-upon system. The few that have recently been arrested have been arrested because, upon advice from Rav Shmuel Auerbach, have decided to break with that system and ignore the initial draft notice completely. 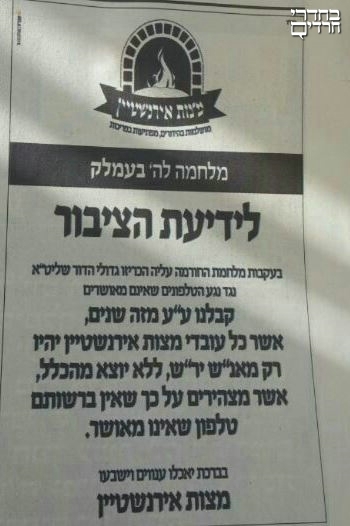 The father of the young man recently arrested is obviously upset about his son being in jail, and this is what he had to say, as reported by Kikar: The feelings are clear, a person wants to sit and learn Torah, and they arrest him.. Even people who sit and learn Torah still have responsibilities in life. One cannot ignore paying the electricity bill and then complain when they shut off the power that he just wanted to sit and learn and they shut off his electricity. A person has to take his kids to school, to the doctor, call the plumber when a pipe bursts, provide for his wife (even if by agreement he doesn't work, but learns, he still has obligations to her, has to keep her happy and must work to make a marriage successful), make babies, pay the electricity bill, pay the water bill, pay the arnona bill, find a school for the kids and pay tuition, etc. If the city puts a lien on your account because you have not paid your arnona bill, it isnt because you just want to learn torah, it is because you did not fulfill your responsibility. If your electricity gets shut off, the same. if your house floods because a pipe burst and you didnt bother fixing it, it is not because you just wanted to learn torah. People, even people who learn Torah, have responsibilities in life. Most people in yeshiva and kollel figure out how to fulfill those responsibilities, or at least most of them, and still learn Torah. True, 16 year olds do not have too many responsibilities in life - but the few they have, they have to fulfill. They need to begin to learn responsibility and choices, cause and effect. I don't blame this kid - he was following his rebbe's advice. If they in that community choose they prefer to be arrested than to respond to the initial draft notice, that is their prerogative. But don't blame it on learning Torah. He wasnt arrested because all he wanted to do was learn Torah. He was arrested because he ignored his initial draft notice. Just like if his electricity had been shut off it would not have been because he was learning Torah. If you thought requiring a business license for operating a newspaper is a violation of the freedom of speech (as guaranteed by the US Constitution but not by any Israeli constitution that does not exist..), you are really not going to like yesterday law proposal submitted by MK Eitan Cabel (Labor). Cabel has proposed that any newspaper of the "big four" daily papers with the widest distribution in the country will not be allowed to be distributed for free but will have to be sold for at least a symbolic price - at least 70% of the cheapest newspaper with the greatest distribution. Basically this law is going to hurt only Yisrael Hayom, which has become one of the widest distributed newspapers (or maybe the widest), but is distributed for free. Supposedly, they explain in the proposal, which is supported by MKs from a number of parties, the objective of the proposal is to strengthen the written press in Israel, and recognize the great importance and strengthen the freedom of expression and democracy. The newspapers in Israel today are in a serious financial crisis and the greatest threat to them is that they cannot truly and fairly compete when other newspapers are distributed for free. Such newspapers are destroying the competition and do not allow the market to recover. I enjoy the irony of "strengthening freedom of expression" by stopping a newspaper from distributing the way it wants to. If this law should pass, Yisrael Hayom would either have to close up shop, begin charging a fee, or lessen their distribution. Saar talks about the peace process, Yair Lapid, and other things..
As redundant as the positions of the two Chief Rabbis has become, they are on the way to being made even more symbolic. With the passing of the new conversion law in the Knesset legislative committee (the bill now heads to the Knesset for voting), The MKs have stripped the Chief Rabbis of their authority over the system of conversions in Israel. The new law will allow any city rabbi to establish a beis din for conversions and potential converts will be able to go to any rabbi he or she wants in order to convert - if one rejects the potential convert, for whatever reason, they can shop around until they find a rabbi who will convert them. I don't know if the law is good or bad. The haredim and some DL are upset about it saying it will bring about the destruction of Judaism. But good or bad, as soon as the law passes, the Chief Rabbis will have become irrelevant. What are the Chief Rabbis for if not to oversee such major systems such as that of conversion? This is just too rich to pass up... According to NRG, Hamodia today published a new ban - against gefilte fish. Rav Shmuel Eliezer Stern has paskened that due to the price of carp being increased leading up to Pesach, it should not be purchased this year, so as to punish the suppliers. Rav Stern says we must prevent the unreasonable price gouging. Banning the purchase of the fish for a period of time is the only way to fix the situation and reverse the increase. MK Aryeh Deri (Shas) played along nicely..
White City Shabbat — a group that helps connect people with Shabbat hospitality in Tel Aviv – has decided to up the ante and set a new Guinness World Record for the World’s Largest Shabbat Dinner. The non-profit organization needs over 1,000 Israelis and new immigrants to attend the dinner set to take place on June 13, 2014.“While White City Shabbat is going to be the first organization to attempt this record, our hope is that in years to come communities around the world will come together to try and surpass the standard we set this year. What a beautifully holy race it would be to have Jewish organizations trying to outdo each other. It will be a real win/win for Am Yisrael,” said Jay Shultz, founder of the group.The dinner will be free of charge for attendees but the group recently launched an Indiegogo crowdfunding campaign to cover the costs. The campaign mimics the theme of The Most Interesting Man In The World Dos Equis commercials but instead features Shultz, in the character of the Most Interesting Jew In The World.“With more and more young Jews from around the world choosing to make Tel Aviv their home, celebrating the first ever World’s Largest Shabbat Dinner with the Guinness Book will further establish Tel Aviv as one of the most important cities for the Jewish People today,” said Eytan White, co-director of White City Shabbat.WCS says the guest list will include notable Israelis such as Tel Aviv Mayor Ron Huldai, former Chief Rabbi of Israel Israel Meir Lau, and Deputy Minister of Religious Affairs, Rabbi Eli Ben-Dahan. Beit Hashalom goes back to Jewish hands!